I first learned the word sonder from a former coworker of mine when we worked together at a camp for kids with Crohn’s and Ulcerative Colitis. This woman also happens to be an outstanding actor, writer, and comedian, and for some reason, the moment where she told me this word is a very memorable moment. While it may partially be due to the fact that this was one of the coolest ladies I had met up until that point, it is also because sonder has become one of my favorite words. I have never stopped thinking about it, and I found my propensity for ‘people-watching’ to take on a different, deeper, hue since then. A neologism from John Koenig’s Dictionary of Obscure Sorrows, “sonder” is defined as “the realization that each random passerby is living a life as vivid and complex as your own.” The concept offers a way to more deeply understand our fellow human beings. This is a key component to rehabilitation, and I believe that sonder is why I continue to have such a strong connection to physical therapy. Though it began as a way to approach creative experiences, I have since been able to apply it on a daily basis to my career as a clinician. 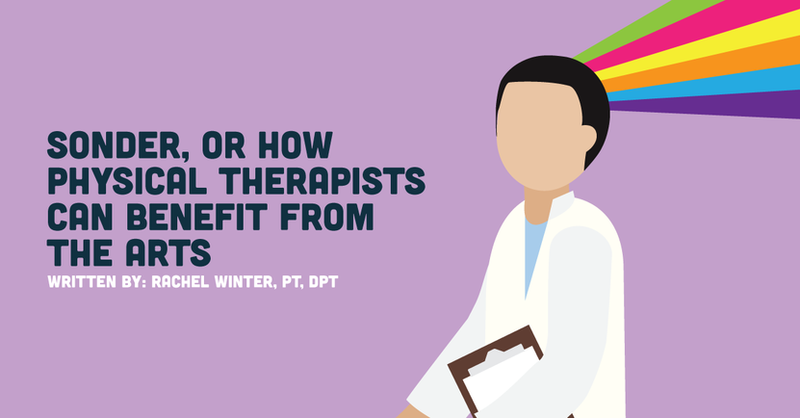 And if you enjoy the arts (be it as a patron of or participant in theater, dance, stand-up comedy, poetry, photography, or a slew of other creative fields), you, too, may find that this predilection strongly influences your career as a physical therapist. Successful PTs perform. I have been fortunate in that I have always worked with outstanding therapists, all of whom realized that in order to ask an individual to complete a task — which was at times the hardest possible thing we could ask of that person — we first had to make the patient feel empowered and energized. Lifting someone up, even “just” metaphorically, can take a lot of energy. It may require some energy "gymnastics," where you aren't sure where the energy is coming from, but it's there, and if you stop moving, you'll lose the inertia that got you from 7am to 6pm on a Tuesday with a ten minute lunch break and back-to-back patients. Sometimes, there's a quieter energy that can lift someone up. It's eye contact and an unwavering ear, a confident plan, a phone call after surgery, a warm embrace at the end of three months of treatment. You are on stage. You are, for better or worse, performing, and if you don't, your patients will go somewhere else. Of the four clinics in the three block radius, why would a patient go to a clinic where the clinician seems disengaged, or complains, or just, plainly, isn't lifting their spirits? It's a skill that many people need to learn. But if you grew up with art, especially performance art, then you already know that each measure, each pose, each line of a script delivered, should accomplish a specific purpose. Your purpose as a PT will primarily be "to motivate." When you're working, you need to be the most engaging version of yourself because this person in front of you is currently experiencing mental/emotional/physical pain, possibly some trepidation or confusion, and needs guidance. And your energy needs to be energizing. If you’re an opera singer, or an interior designer, or an author, or a photographer, you're connecting with others. You want to move people, which (go figure) carries over well into the PT realm. In physical therapy, goals change, diagnoses change, patients change, but connection does not. One of the first things that drew me to physical therapy was the notion that I could make genuine, human connections with those around me. I could move them and be moved in return, and in all its chaos and unpredictability, life would feel a bit more concrete for a moment. That played a large role in my decision to pursue PT. Concrete connection. Cause and effect. Move and be moved. A great PT is able to think critically about what choice to make and why, to do it quickly, and to do it often. PTs are very creative and adaptable. Every person who walks through that door has a plan of care that is unique from the person before them. If there are five tools in your toolbox to treat a specific diagnosis, and you attempt one, as long as you have sound reasoning, then you've done right by your patient. There are lots of ways to treat. The thought process should be, how am I going to get this particular tissue to move in a way that this patient will a) tolerate, b) build confidence, c) relieve discomfort, and d) address their personal goals, i.e. pick up a child from the crib, walk a daughter down the aisle, take care of an aging partner, exercise without urinary leakage (shout-out to pelvic floor/women's health PTs). While the finesse and proficiency of clinical decision-making takes significant skill and hours of patient treatment, rounds, mentorship, discharge planning, etc., the knack for creativity does not. If you can think on your feet and have sound judgment behind your choices, then you have a key foundational quality in becoming a great PT. In conclusion, if you have a history of — or appreciation of — design, acting, painting, writing, sculpting, photography, etc., then you are likely highly capable of understanding that strangers' lives are full of wonder, needs, wants, and complexities that are as tangible as yours. Your ability to harness this awareness and build upon it will facilitate outstanding clinical care, and it will lead to wonderful relationships with patients and fellow providers throughout your career. I urge you to find what moves you, because you will move others, and be moved in return. All that movement might just do the body good.